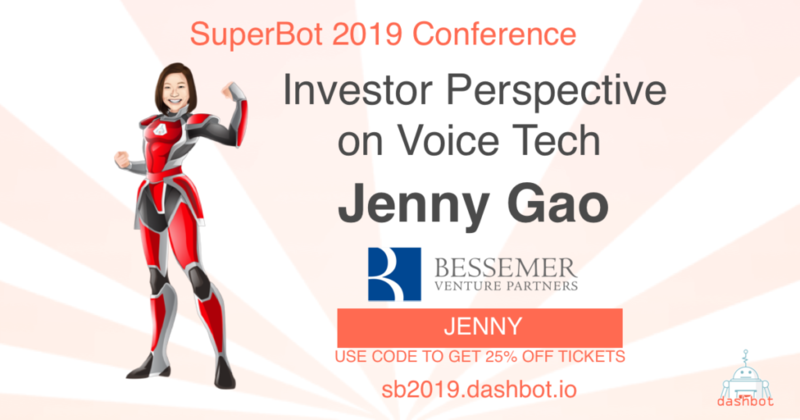 Jenny Gao, Venture Capital Investor for Bessemer Venture Partners, will be attending SuperBot this year to give investor insights on the conversational AI space. Jenny Gao joined Bessemer in 2015 as an investor in the New York office where she focuses on cloud-native infrastructure and developer tools, machine intelligence, voice platforms and consumer web. Prior to joining Bessemer, Jenny was part of the foreign exchange solutions group at State Street. She also worked in business development for BVP-backed company Clear Ballot, focusing on a go-to-market strategy for their electoral audit product, as well as content development for an international education startup. Jenny graduated from Harvard with a B.A. in Applied Mathematics with a focus in Government and Computer Science. While at Harvard, she founded the STEAM Initiative at the Harvard Kennedy School Institute of Politics, a program at the intersection of STEM, the arts, and politics. In her free time, Jenny is a foodie, improv performer, and plant enthusiast. Read more about Jenny and her thoughts on investing here.